Winter Park, Colorado is an idyllic ski village of 999 residents. Unsurprisingly, as it hosts one of North America’s top ten ski resorts, the main industry in town is tourism. 370 businesses are members of the Winter Park & Fraser Chamber. Anyone is welcome to join the Chamber, if they want to target the one million ski bunnies that hop on through each year. Businesses from surrounding towns to across the US plan annual events with Winter Park. Pulling these events off year-over-year is now like clockwork but for the ten-person team at the Chamber, a customized workflow focused on templates and automated task assignments keeps the machine well-oiled. To make sure the 40+ events per year at Winter Park go off without a hitch, the team relies on Redbooth, Wufoo forms, and app automation platform Zapier. Everything from equipment rental requests to expenses are collected via a Wufoo form. Behind the scenes a “Zap” (Zapier’s lingo for an automation between two apps) adds the form data to Redbooth, automatically creating tasks for their team to tackle. Let’s see what this kind of event management looks like. “Most of our work repeats itself year after year,” says Economic Development & Project Manager Jeremy Kennell. The Chamber team has created a customized workflow that begins with the WuFoo online form builder and email, which then “zaps” via Zapier to populate and assign tasks within workspace projects in Redbooth. They also use Dropbox for document storage that links directly to Redbooth tasks. There are a lot of repeat equipment requests, so if someone from their member organization wants to borrow a table or a projector, they fill out a WuFoo form on the website, automatically creating and assigning a task within Redbooth. This provides a real-time view of who has rented what and which items are still available. This WuFoo-Redbooth integration also helps manage their accounting. Internal accounting requests are submitted into a WuFoo form and then the team sees the status of what’s paid and what’s still pending. In both situations, this integration auto-assigns the tasks to the appropriate team member within the project’s workspace. For the team, efficiency is key when redundancy is tied to an annual events calendar. Utilizing custom templates and creating recurring tasks with document repositories are just two examples of Winter Park’s streamlined workflow. One can only ski so many hours a day, so many members of the Chamber are focused on other Winter Park festivities like annual food, wine and music festivals. Beyond their ten-person, full-time team, the Chamber onboards seasonal staff for certain projects and sometimes contracts with other organizations. For this, they invite external users to a specific Redbooth workspace giving continuous insight to the status of the project. “It’s a nice token with an outside stakeholder that they receive visibility into the project itself, instead of waiting for status updates,” he said. Being an Inbox Zero fan, Jeremy loves how Redbooth’s task management steers traffic away from his email, avoiding the usual back-and-forth — Can you do this? Have you done this? “It’s easier to throw it into Redbooth and we know it’s there and we can chat back and forth on the tasks, instead of sending an email and then another email,” he said. They even use certain email aliases that automatically forward from Microsoft Exchange into a workspace, assigning the email as a task. 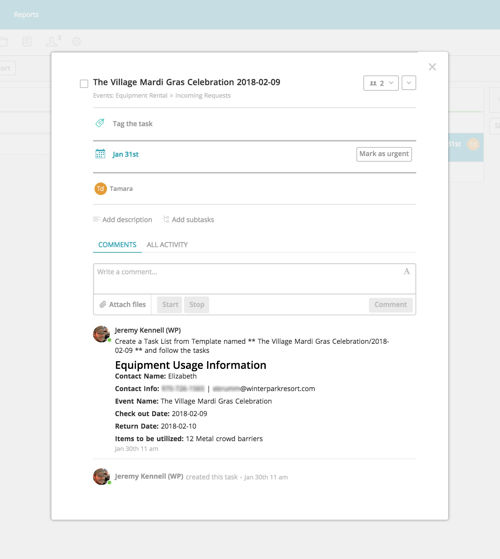 For example, if a vendor sends an email to rent a booth at a music festival, the content of the request automatically goes into that festival’s workspace and gets assigned to the event coordinator. The Chamber team continues to customize their workflow with integrations that are built in Zapier, which take about five minutes to create. It’s not the technical side that takes time but rather the thinking about the workflow ahead of building. “You have to think about what you want to get out of it, how are you building those forms, what information is in it, and how is that information paginated?” Kennell said. In a recent conversation with Zapier, Kennell expanded on the set-up process. Then you have to think about how you break that information into task details and who will perform what tasks. A hot tip on setting up your Zapier integrations: select just one or two people to be in charge of creating the Zaps. They were initially attracted to the robustness of the tool but ultimately chose Redbooth for the Chamber’s project and task management needs because of its customization within the workspaces and templates. Redbooth also cut down on the chatter in the office and enables team members to work remotely. In the end, the team maximizes repeat projects by duplicating file structure via Redbooth templates, which makes it easier for everyone involved. Get started with Redbooth and a Zapier integration to streamline your workflow today. Need some inspiration on where to start? Here are a few of the most popular ways Redbooth users like you are automating their work.